In theory, a poor country with a low saving rate but good growth prospects can build up its capital stock by running a large and sustained current account deficit. This column asks whether this is feasible and productive in practice. A substantial number of countries in recent decades have been able to run large current account deficits for as long as ten years, but such episodes typically do not end happily. 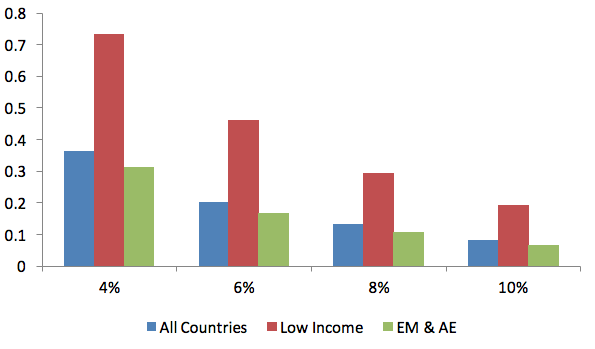 Foreign finance does not appear to be the cure for countries with low domestic savings. In a closed economy, investment is limited by domestic savings. In an open economy, in contrast, countries can invest more than they save by tapping foreign finance. In theory, a poor country with a low saving rate but good growth prospects can build up its capital stock by running a large and sustained current account deficit. The question is whether this is feasible and productive in practice. In a new paper, we address this question by first identifying large and persistent current account deficits episodes and then exploring the implications of these episodes for long-run growth and economic stability (Cavallo et al. 2016). The IMF has long regarded current account deficits greater than 4% of GDP as a danger sign. Deficits above this threshold indicate that a country is exposing itself to the risk of a current account reversal and growth collapse when the capital inflow that previously financed the deficit comes to a sudden stop. Conscious of the risks, investors will hence be reluctant to finance current account deficits persistently exceeding this threshold. Our research supports one part of this conventional wisdom but not the other. Contrary to received wisdom, we identify a substantial number of countries since 1970 that have been able to run current account deficits in excess of 4%, or even 6% or 8% of GDP for as long as ten years. Figure 1 shows the share of episodes for different current account deficit thresholds. The blue bars plot the data for all countries, the red bars focus on low-income countries, and the green bars show the share of episodes for emerging and advanced economies. More than a third of our observations are characterised by average current account deficits greater than 4% of GDP. Using the 6% threshold, we find that one-fifth of observations qualify as large and persistent current account deficit episodes, and when we adopt the 8% thresholds, 13% of observations qualify as episodes. While a significant fraction of these episodes are in low-income countries where official finance is more important than private finance, we have also identified a number of episodes financed with private capital inflows. It has been possible historically, in other words, for countries to finance a significant portion of domestic investment out of foreign savings, in contrast to popular presumption. Predictably, when we push the threshold to 10% of GDP we find that large and persistent current account deficits are much less common. There are only 25 such episodes (8% of observations in our sample) concentrated in sub-Saharan Africa and emerging Europe (there are no 10% episodes in Asia or the advanced economies). Our finding that reliance on foreign savings for domestic investment is more feasible than suggested by Feldstein and Horioka (1980) is consistent with the findings of Bayoumi (1990) and Taylor (1994) who show that data like those used by Feldstein and Horioka look very different before 1913, when the savings-investment correlation was looser and late developing countries like Canada, Australia, and Argentina relied substantially on foreign savings for domestic investment. But when we study how large and persistent current account deficit episodes end, our results are more consistent with the conventional wisdom: typically, episodes do not end happily. Instead, they end abruptly, with compression of the current account, real exchange rate depreciation, and a sharp slowdown in investment. This finding is in line with the literature on sudden stops (Calvo et al. 2004, Cavallo and Frankel 2008). Sudden stops are when foreign investors dump domestic assets and reduce or eliminate the external financing available to countries that invest more than they save. The affected country has to abruptly close any outstanding current account deficit, normally through a combination of real exchange rate depreciation and import contraction. Real exchange rate depreciation can be particularly disruptive because it raises the cost of servicing foreign-currency-denominated debt, triggering bankruptcies and causing the country to incur large output costs. Costly sudden stops may explain why we find that reliance on foreign savings does not have a positive effect on long run growth. While large and persistent deficit episodes are characterized by above-average growth in the first four to five years of the episode, this growth advantage is completely lost after five years. Over a 20-year horizon the total growth effect of persistent current account deficit turns negative (Figure 2). A possible explanation for the dismal record of foreign finance in sustaining faster rates of economic growth has to do with the fact that countries that borrow abroad do not seem to invest more in equipment and machinery. DeLong and Summers (1991) found that investment in equipment is a key driver of economic growth. We therefore checked whether countries with large and persistent deficits use foreign savings to finance the imports of machinery and equipment and found that large and persistent current account deficits are actually associated with lower imports of machinery relative to GDP. 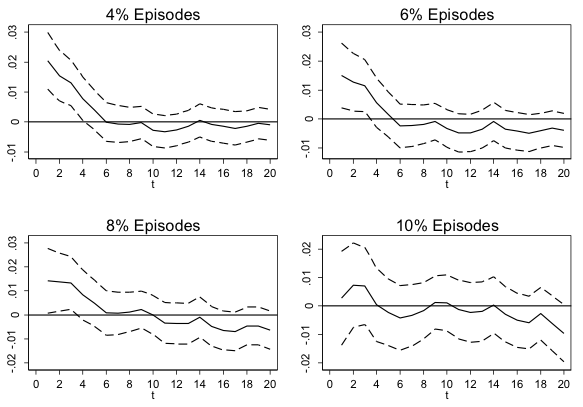 The difference between episodes and control group cases ranges between 4 and 7 percentage points and is statistically significant at the 1% confidence level. When we look at the effect of foreign finance on output volatility, we find that relatively small deficits (4% of GDP) deliver less volatility in the short run at the price of more volatility after the episode ends. When we consider episodes characterised by larger current account deficits we find higher output volatility both during and after the episodes. We conclude that while financing growth and investment out of foreign savings is not impossible, it is risky and does not yield a clear growth dividend. A corollary is that foreign finance is not the cure for countries with low domestic savings. Bayoumi, T. (1990), “Savings-Investment Correlations: Immobile Capital, Government Policy or Endogenous Behavior?” IMF Staff Papers 37, pp. 360-387. Calvo, G., A. Izquierdo and L.-F. Mejia (2004), “On the Empirics of Sudden Stops: The Relevance of Balance-Sheet Effects,” in Proceedings, San Francisco: Federal Reserve Bank of San Francisco (June). Cavallo, E. and J. Frankel (2008), “Does Openness to Trade Make Countries More Vulnerable to External Crises, or Less? Using Gravity to Establish Causality,” Journal of International Money and Finance 27, pp. 1430-1452. DeLong, J. B. and L. H. Summers (1991) "Equipment Investment and Economic Growth," The Quarterly Journal of Economics 106(2), pp445-502. Taylor, A. (1994), “Domestic Saving and International Capital Flows Reconsidered,” NBER Working Paper no. 4892.